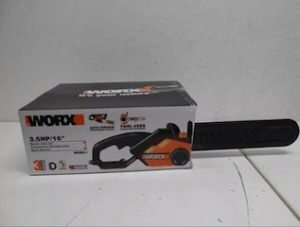 A brand new boxed Worx orange and black 3.5HP 16 inch electric chainsaw. 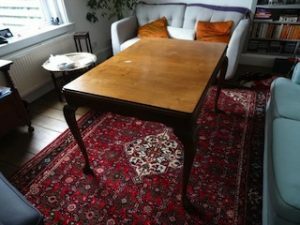 A large solid wood vintage coffee table, together with an antique style large area rug decorated with a colourful pattern against a red ground. 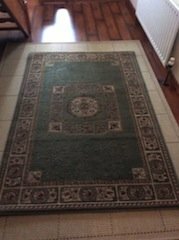 A large woollen vintage area rug, decorated with a floral centre motif against a green ground. 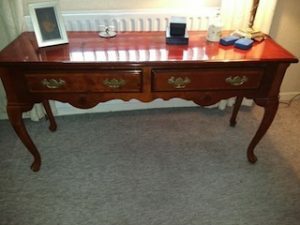 A vintage solid mahogany console table with light carving detailing, having two large brass handled drawers. 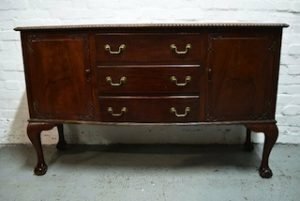 A solid mahogany vintage sideboard dresser with light carving detailing, having a cupboard to either side of three central brass handled drawers. 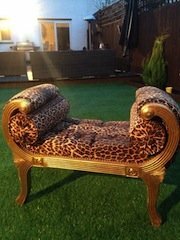 A solid wood heavily carved hand painted gold piano stool, upholstered in leopard printed velour. 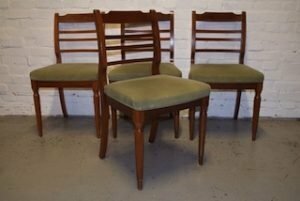 A set of four vintage mahogany low back dining chairs, upholstered to the seats in olive green velour. 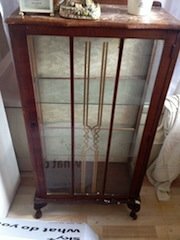 A tall standing glass panelled vintage mahogany display cabinet, having two glass shelves inside. 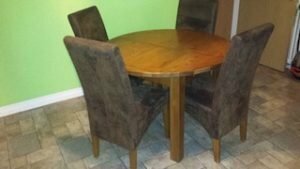 A solid wood circular extendable dining table, together with four matching high back dining chairs, upholstered in grey velour. 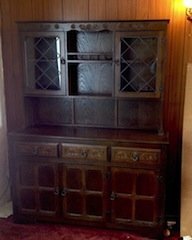 A tall standing solid oak and glass inlaid vintage kitchen dresser, with light carving detailing. 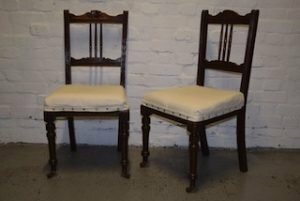 A pair of carved mahogany vintage low back dining chairs, upholstered to the seats in cream fabric. 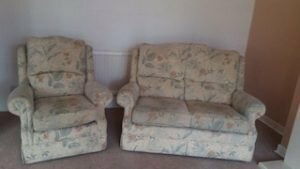 A two seater high back vintage sofa and matching armchair, upholstered in floral patterned fabric. 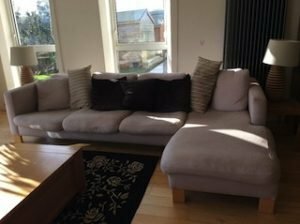 A large five seater low back right hand corner sofa on pine legs, upholstered in cream fabric. 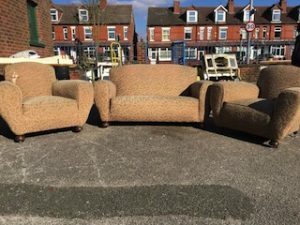 A three piece vintage sofa suite, to include a two seater high back sofa and a pair of armchairs, upholstered in leaf patterned gold and cream fabric, on solid wood ball feet. 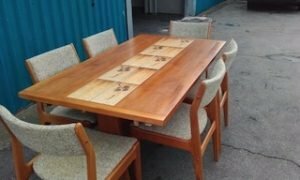 A large solid wood rectangular retro dining table, together with six low back dining chairs. 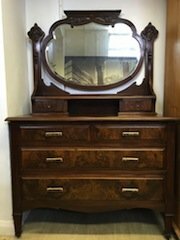 A heavily carved vintage mahogany dressing unit on castors, having a large bevelled swing mirror above six various sized drawers. 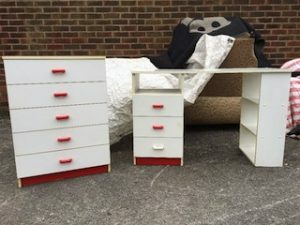 A white and red wood three drawer desk and matching large chest of drawers. 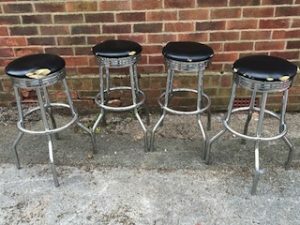 A set of four tall chrome breakfast bar stools with footrests, upholstered to the seats in black faux leather. 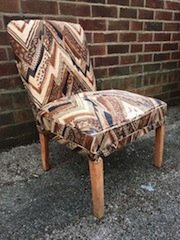 A vintage high back nursing chair on solid pine legs, upholstered in quirky patterned retro fabric. 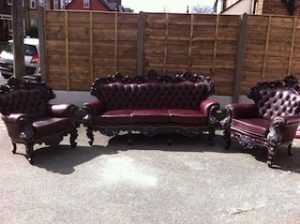 A three piece vintage style sofa suite, to include a heavily carved mahogany three seater sofa and two matching armchairs, upholstered in ox blood red leather.